← Add one huge dose of Humanity First – Combine with Social Community Media Interests = One Amazing Pizza. Many, many times I have fallen into finding a park, finding a way to a particular market or museum, only to find that all this time there is another more efficient, or alternative location, or event, or attraction, that has existed and eluded my attention. Those are good days as no matter the area where you live, you receive a brand new outlook on your life, be it impacting your schedule or attitude towards things for the better. I know, an example is in order. It was easy to transfer this small but cool find to the past week of newly hired teachers arriving at ASF, seeing Mexico in brand new eyes, whether they had originated from outside Mexico or simply transferred within, as members of the Welcoming Committee, we get the privilege of also seeing the familiar around us with new eyes and appreciate the country we find ourselves now calling home. I also realized how far I have to go to really undermine the characteristics and inclination I have to complain about things that I should not even address. Being in Mexico has certainly changed my demeanor, attitude towards taking in what life has to offer, and has chipped away at how better to work through obstacles in a much more positive note rather than get bogged down in attitudes of regret and regression. Yet, the learning process is even that more pleasurable with amazingly positive, enjoyable, and pleasant coworkers, both new and returning, that remind you every day how much we should appreciate the experiences around us. 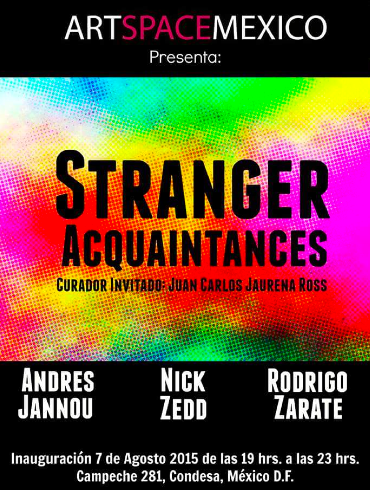 Seeing Andres Jannou and Rodrigo Zarate AT ArtSpace for their gallery show last night, enjoying the information provided by Peter and Lidia from Azteca Travel at Spice Everywhere certainly also allowed me to reflect on the “wonderfulness” of good and positive people and experiences around us every day, and appreciate the detailed events I experienced while I as in the states. Life is so full of possibilities and exciting discoveries, from a closer dog park to breaths of fresh air every year through new friends, but if e leave every day with these abilities to appreciate the details we often take for granted around us? – we will literally be “new hires” every year in attitude and what we can offer others as well. This entry was posted in Uncategorized and tagged Alexander Pushkin, Andres Jannou, ArtSpace, Azteca Travel, Rodrigo Zarate, Spice Everywhere, Stranger Acquaintances. Bookmark the permalink.